Hobo Mama Reviews: Tea Collection: $15 dress event for Black Friday! Tea Collection: $15 dress event for Black Friday! 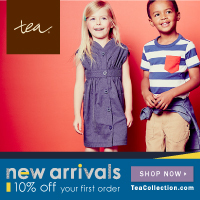 The Tea Collection Black Friday Sale is on — shop now for great deals on the cutest children's clothes. Healthy Child Summit: Free sneak preview! Appleseed Lane: 50% off a science & craft box! EasyLunchboxes: First-ever 20% off sale! Squatty Potty: 20% off for Cyber Weekend! MyPublisher: Free hardcover photo book! BabyLegs: 65% off + free shipping! ModCloth Black Friday: 100s of items 50% off!